Ergonomic Footrests: What Are They & Do You Need One? People spend a lot of time sitting these days. In fact, the average person spends 10 hours per day sitting. Those that work in office environments may spend even more time sitting as they go through their workday and then head home to relax. One of the problems with spending so much time sitting is that many people are not sitting correctly. Slouched postures, poorly adjusted chairs, or accessories like monitors and keyboard positioned incorrectly can all contribute to pain and inefficiency in the workplace. 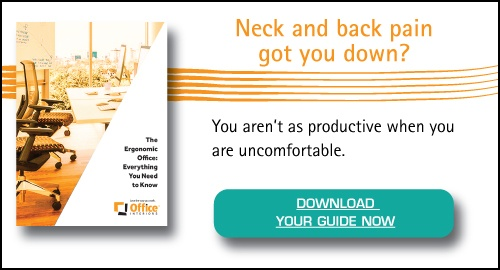 However, there are a lot of people that have all of the right ergonomic accessories at their disposal and still feel pain at the end of a long workday. What could be the problem if they are sitting straight with a good chair, a properly adjusted monitor, and a keyboard tray that suits their height? The answer may be lurking just below their feet. In this blog post, we will look at the role footrests play in office ergonomics, explain who needs a footrest and who can do without, and finally describe the proper use of an ergonomic footrest. A desk footrest is not a standard accessory you will find around the office. It often goes overlooked when compared with other high profile ergonomic accessories like keyboard trays and computer monitor arms. However, a desk footrest placed on the floor can be an excellent accessory for those who need it. 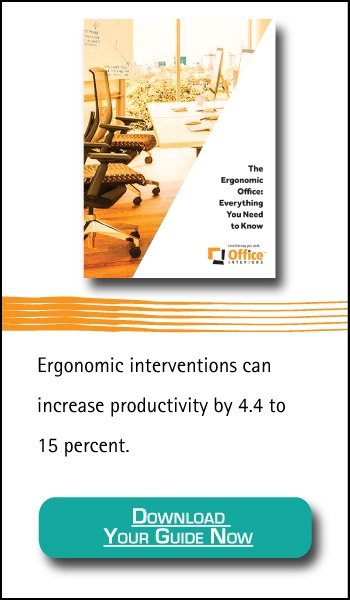 As mentioned in some of our other posts, ergonomics is the study of how humans interact with their tools and how those interactions can be improved with ergonomic accessories. In previous posts, we have looked at items like keyboard trays that will enhance your experience using your existing furniture. A footrest is a little different because most likely, in your current workspace, everyone’s feet currently rest on the floor. Footrests allow the feet to rest flat while sitting and create the ideal sitting position for reducing ergonomic injuries like chronic back pain. That’s right; a little footrest can be a big deal. Who Should Use an Ergonomic Footrest? Unlike other ergonomic accessories, we have discussed in these blog posts; an ergonomic footrest is not for everyone. The need for a footrest can depend on your body as well as your work environment. For those who need one, a footrest is an essential tool. An ergonomic footrest is recommended when a chair is too high for your feet to reach the floor. People often discover they need a footrest after going through the process of setting their chair to the correct height. You would ensure that your arms can quickly reach the keyboard and mouse, you can comfortably see their monitor with the top edge of the monitor lining up with your eyes, and the armrests are set to the correct height. If you have done all this and your feet are not resting flat on the ground, you are going to have a problem. As you can imagine, people who have a shorter frame are often the ones who opt to have a desk footrest at their workstation. The footrest offers a flat surface to rest the feet and ensures a proper posture while sitting. Some workstations may also have higher pieces of furniture and require a footrest regardless of the height of the person in the chair. Take counter height tables and workstations for example. Unless you happen to be a former NBA player, you’re probably going to need to use a task stool or footrest to work ergonomically at counter height. Another excellent reason to use an ergonomic footrest is to improve circulation in your legs. When seated for prolonged periods of time, your seat cushion can put pressure on your thighs, reducing circulation to your legs. By improving circulation in your legs with a footrest, you can eliminate leg pain and stiffness, reduce your risk of developing varicose veins or clots and keep yourself feeling comfortable throughout the day. Ready to Rest Those Weary Feet? As you can see, a footrest is a little different than other ergonomic accessories in the workspace. Instead, footrests are most advantageous for specific people or situations. If you aren’t sure if an ergonomic footrest would improve your comfort at work, ask our ergonomics experts. You deserve to Love the way you Work!